Once again, I return to the Dresden Files. While I was a bit disappointed in the previous installment, Grave Peril did set up a massive conflict between the wizards' White Council and the Red Court of vampires that I was interested in seeing play out. Which is why I was a little confused to see it take something of a back seat. 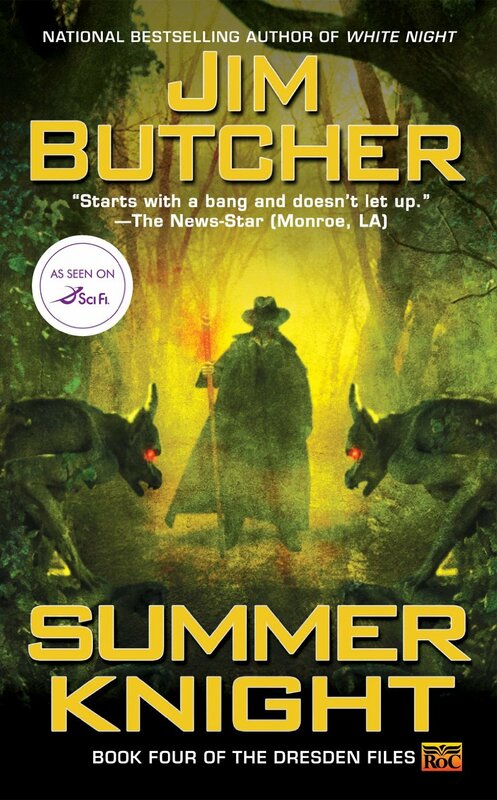 In Summer Knight, the reader returns to find Harry Dresden a mere shadow of his former self. Obsessed with finding a cure for the vampirism that has infected his girlfriend, he has completely withdrawn from friends, is struggling to keep up with rent and has even fallen behind on basic hygiene. When he is at what is arguably his lowest ebb, he finds himself drawn into a murder mystery that could cause an Armageddon-level war between the Summer and Winter courts of the Sidhe (Faeries to you and me, but don't let them hear you call them that). Worse than that, if he doesn't solve the mystery and somehow lives, then the White Council will call for his execution for his part in starting the war with the Red Court. 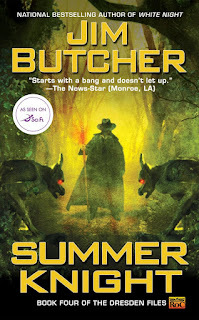 Whatever issues Grave Peril had, it would appear that it was only a temporary blip in the quality of the Dresden Files. Summer Knight is everything that I love about the series in one spot. There's all sorts of dangerous politics, both from the White Council's willingness to throw one of their own under the bus, and from the seductive and pernicious deals of the Faeries. There's an unwelcome face from the past in the form of Elaine, the ex-girlfriend who teamed up with his former teacher to try and bring him over to the dark side. Apparently she wasn't acting under her own power, but as she is acting as an emissary to the opposing Faerie court that has hired Harry, how much of her word can he believe? There's the introduction of changelings, half-mortal and half-Faerie and not really at home in either world. And, best of all, there is my absolute favourite cop, Karrin Murphy, being a complete badass even when she's having to work through the magic equivalent of PTSD. What more could I ask for? If there was something that did bother me, it was that for a conflict that wiped out one of the White Council's most senior wizards, the war with the vampires only seemed to get the most cursory of nods right at the beginning and again a little before the final conflict. It would have been nice to see a bit more direct conflict with the Red Court, because what we do get seems to be a bit throwaway and nonsensical.